The extension by over a year for Sinha, approved by Prime Minister Narendra Modi-headed Appointments Committee of the Cabinet, would make him the second-longest serving Chairman of the capital markets regulator Sebi in its over 25-year-history. Sinha was initially appointed for a three-year term during the UPA regime and was later given a two-year extension. While his current term was to end on February 17, he was eligible for a one-year extension as a person can hold the position of Sebi Chairman till the age of 65, which Sinha would reach next March. "The Appointments Committee of the Cabinet has approved re-appointment of U K Sinha, Chairman, Sebi with effect from February 18 up to March 1, 2017 or until further orders whichever is earlier," a government notification said. This would keep him in office for little over six years - the second-longest for this position after D R Mehta's seven-year term from 1995 to 2002. The regulatory ambit of the Securities and Exchange Board of India (Sebi) has further expanded in recent months with the merger of erstwhile commodities regulator FMC with it. Sebi, which regulates stock exchanges, various kinds of market entities including brokers, mutual funds, FIIs, rating agencies and investment bankers, as also thousands of listed companies, was also given greater powers during Sinha's tenure to help it crack down more effectively on market manipulators and fraudulent money-pooling schemes. There have also been apprehensions that a change of guard at this time can be avoided given the sharp volatility in the capital markets globally. During his tenure, Sebi has implemented a number of capital markets reforms including those related to IPOs, mutual funds and corporate governance. A key initiative announced recently is a new regime for listing startups. 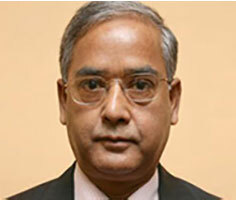 Sinha, a 1976 batch IAS officer of Bihar cadre, assumed office as the Securities and Exchange Board of India (Sebi) chairman on February 18, 2011. The government in August last year had initiated the process for selecting Sinha's successor at Sebi and a search panel, headed by Cabinet Secretary, was also constituted. However, there could not be any consensus on the names suggested by the panel. As per reports, the short-listed names included SBI Chairperson Arundhati Bhattacharya, former FMC Chairman Ramesh Abhishek and Thomas Mathew who has earlier served as Joint Secretary (Capital Markets) in Finance Ministry. Other keenly watched developments during Sinha's tenure have been the action taken by the regulator against hundreds of ponzi schemes and lately against over 1,000 individuals and companies suspected of tax evasion and laundering of black money through the stock exchange platform. Sebi has also acted against illicit money-pooling schemes from high-profile groups like Sahara, Saradha and Rose Valley, while several big corporates including Reliance, DLF and FTIL have seen regulatory action against them during his tenure. Before joining Sebi, the current Chairman Sinha was heading UTI Mutual Fund. Prior to that, he had served in Finance Ministry, among other positions, as an IAS officer. But after quitting civil service, he was given another five-year term as CMD, not as a government nominee, but as the choice of the stakeholders of UTI AMC. State Bank of India (SBI), Bank of Baroda (BOB), Life Insurance Corporation (LIC) and Punjab National Bank (PNB) are the promoters of UTI MF. Sinha earlier held key positions in the Government of India, notably in the Ministry of Finance, where he was the Joint Secretary, looking after capital markets, external commercial borrowings, banking and currency and coins. During his tenure at the ministry, he spearheaded several initiatives, such as banking and capital market reforms. The government had in December last year reconstituted the search panel to include a representative from the Prime Minister's Office (PMO). The revamped panel, headed by Cabinet Secretary P K Sinha, included Additional Principal Secretary to Prime Minister, Economic Affairs Secretary and three experts nominated by the central government. In addition to the post of Chairman, the government is empowered to appoint five members on the board of this key regulatory body.